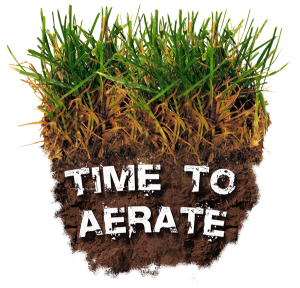 Treat Your Lawn - Aerate It! For compacted soil we strongly recommend that you have A Cut Above Lawn Service of Monument CO, aerate it for you. Getting your lawn aerated, which pulls cores, or plugs of soil, out of your lawn, allows for more air, nutrients, water and grass seed to penetrate the soil, allowing for a greener, fuller lawn. Why should your lawn be aerated? Well, overtime, with foot traffic, vehicle traffic, heavy snow, etc. mashing down the soil of your lawn, nutrients and other important particles (water, seed, fertilizer, ect.) have a hard time getting to the roots of your grass. Even regular mowing can take a toll on your lawn and cause compacted soil. As you can imagine this causes issues and can be detrimental to a healthy lawn. Lawn Aeration should take place during high growth periods which allows for the lawn to recover from the holes that will be punched into it. Do not worry about these holes, as they will allow your lawn to receive the nutrients that it so desperately craves. Warm season grasses, such as the type of grass that we have here in Monument is best done in the spring time, but can also be done in late summer or early fall as the heat starts to die down. Are you ready to help your lawn breathe?